We bought our first boat when we were newly married but when life got busy and we stopped using it, we sold it. We bought our second boat in April of 2008. Long story short? Very expensive lesson. The engine died on us 5 miles off shore and I had to hand pump the fuel line to the kicker engine to get us back to land. Not my favorite day. The engine? Uneconomically repairable. The boat? Unsellable. Because the nicest looking guy, who thinks his boat is great – can be WRONG. And we bought it. But, like I said, we learned from the experience. We paid a mechanic $300 to thoroughly check it out (an expensive test, but well worth it) and test drove it before we bought it. Learn from our previous mistakes. 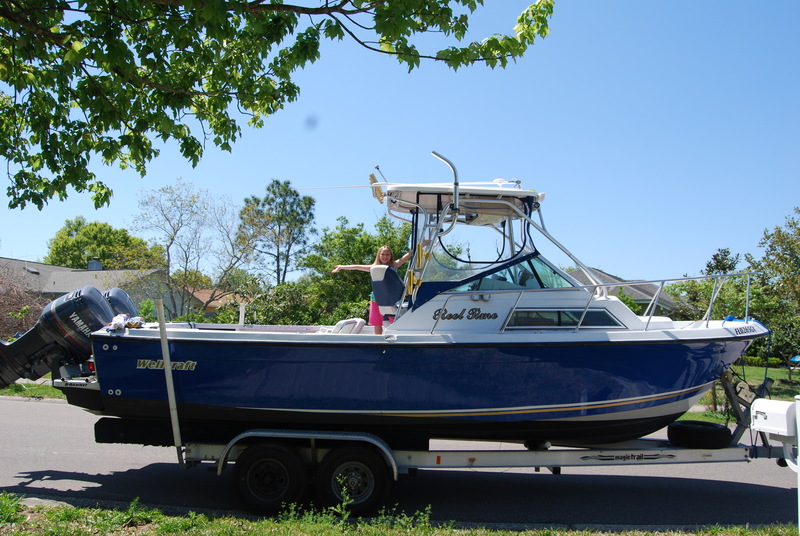 Do not buy a boat without DRIVING it in the water and no matter what – pay an objective, third party, professional boat mechanic to completely check it out! Then buy the boat. 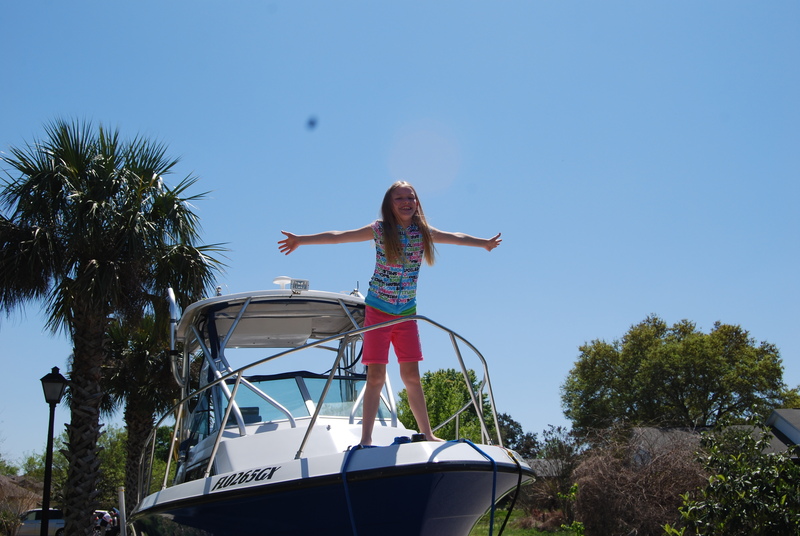 We took our new boat out on the Banana River on Easter afternoon and on the ocean today. GREAT experience. We saw porpoises yesterday and sea turtles today. FavoriteSon loves it too, but he’s 14 and does not easily pose for photos. Me? I’ve said this before. You can actually feel the tension sliding off your shoulders when you’re on a boat as you travel out the channel out to open water. NOTHING like it. FirstHusband: “There’s a shade of blue that the ocean takes on when you get far enough from shore that neither Bill Gates nor Home Depot can color match on a computer. No matter how much Earnest Hemingway you read or how much Jimmy Buffet you listen to, the ocean has to be experienced to be truly appreciated. We have a new favorite thing about boating. Our previous favorite thing used to be the experience of heading east out of Port Canaveral on a cool morning, our new favorite thing is each of us taking a turn saying a prayer for the day’s family trip as we head east out of Port Canaveral in the morning. ← pragmatic communion: God has a desire for my affirmation of His love? Living about 3 hours away from the nearest NJ or MD or DE ocean, a boat would not be a wise investment on our part. Mom great picture of me you should be a photographer .p.s.you helped me spell photographer. I love u!!!!!!!!!!!!!!!!! !